Discussion of the archaeological ethics surrounding the collecting of antiquities and archaeological material. 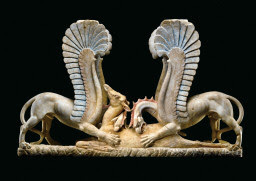 So far, more than 5,000 visitors a day have braved the chilly weather and the steep Quirinal Hill to see the 69 long-disputed Greek, Etruscan and Roman works on view - most the fruit of landmark deals with leading US museums. Our tough fight to get these objects back has been amply compensated by the sight of the thousands of people who appreciate the beauty of these works and the significance of their coming home ... There is nothing sadder than great institutions who for years accepted works bought from traffickers ... That era is over now. In late 2003 two metal detectorists were working in a field in Yorkshire. They found 'treasure' buried just beneath the surface – a collection of Viking material next to a body. Although they had been detecting on the site for a number of years, during which time they had made large numbers of finds, nothing they had uncovered previously compared with this. They decided to share their discovery with archaeologists.The programme explored the tension between metal-detectorists and the English Heritage sponsored archaeologists putting six trenches into the field based on a geo-physical survey. Finds made by the metal-detectorists did not easily map onto the archaeological features. I have been busy working on an overview, "Returning Archaeological Objects to Italy". The scale of the returns to Italy from North American collections and galleries is staggering: in excess of 350 objects. This is clearly the tip of the iceberg when it comes to the material that has surfaced on the market without a history that can be traced back to the period before 1970. I will provide more information in due course, but the researcher is a reminder that we need to take due diligence seriously when it comes to making acquisitions. The Hellenic Ministry of Culture has announced (Saturday 8 September 2018) that a stele that had been due to be auctioned at Sotheby's in London in June 2017 has been returned to Greece (Friday 7 September 2018). The identification had been made by Cambridge-based forensic archaeologist Dr Christos Tsirogiannis. It appeared that the stele had been supplied with a falsified history as its presence with Becchina until 1990 contradicted the published sale catalogue entry. It then moved into the hands of George Ortiz. A year ago it was suggested that Sotheby's should contact the Greek authorities. Those negotiations appear to have concluded successfully. The 4th century BC stele fragment, with the personal name, Hestiaios, will be displayed in the Epigraphic Museum in Athens. It appears to have come from a cemetery in Attica. Will the Cleveland Museum of Art be Next? Lord Renfrew on "Dodgy Dealers"
Portable Antiquities Scheme: Funding Cuts? "An era of scrupulous acquisition policies"
"Looting Matters" welcomes feedback, comment or corrections. This work is licensed under a Creative Commons Attribution-No Derivative Works 2.0 UK: England & Wales License.